Spatula! (Get your mind out of the gutter, you cheek!) I scored a really awesome and BIG Le Creuset spatula/scraper in a fun olivey green at Home Goods yesterday. (A big THANKS to my friend Erin who incorporated a trip to Homegoods with a search for her new apartment. I don't go to Home Goods often, because they are not really accessible to me, but I like it because it's like the Marshall's or TJ Maxx home section (my favorite section of those stores) on steroids. Sure, you have to kind of ignore the sensory overload of the faux flowers and huge paper mache roosters, but you can find some good deals on essentials. I will definitely go there if I ever need table lamps; their selection in that department was fantastic. 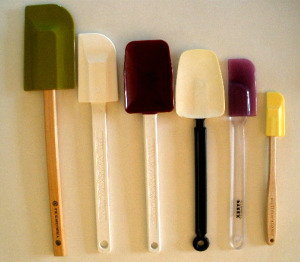 But, on to the subject at hand, my spatula. I like my teeny one on the far left, from the Williams Sonoma Outlet, for getting the last bits out of jars. The two Pampered Chef ones are good all-rounders. I don't know why I have the black handled one...it was kind of a cheap, Kmart purchase a long time ago, but I guess I figure you can never have too many. However, as you can see, the new one trumps them all in size. Can't wait to dive into some new recipes to try it out! Oh thanks, I have been meaning to replace my two sad black-handled spatulas and this is totally the motivation I needed! Doubt I will score a snazzy le Creuset one anytime soon though, I'm jealous!